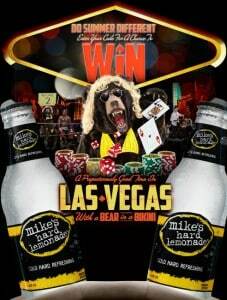 Click here to visit the Mike’s Hard Lemonade site and fill out the form to enter. For promo code, just click the don’t have one link underneath the form. They’ll instantly tell you if you’re a winner. If you aren’t, no worries because you’ll still be entered to win a trip for 2 to Las Vegas. You can play this one everyday through June 18th. 36 First Prize winners (six  per Week) will each be awarded a Leisure Jacket. Thirty Six (36) Second Prize winners (six  per Week) will each be awarded a Slot Machine Refrigerator. Two Hundred Forty (240) Third Prize winners (forty  per Week) will each be awarded a Poker Set. One Hundred Fifty Six (156) Fourth Prize winners (twenty-six  per Week) will each be awarded a Card Shuffler. Seven Hundred Fifty (750) Fifth Prize winners (one hundred twenty-five  per Week) will each be awarded a pack of Playing Cards.